This article is an expansion on findings in the AWR Working Paper 18, The past, present and potential futures of abortion in Ireland: Insights from international abortion data. Ireland voters overwhelmingly voted on 25 May 2018 to repeal their constitutional protection of human life in the womb. The Irish government has stated their intent to seek legislation this year which would broadly permit abortion in the Republic of Ireland in the first 12 weeks of pregnancy, plus increase medical reasons under which abortion is permitted up to birth. The campaign leading to this vote was characterized by significant misrepresentations of fact by the pro-abortion side. Such claims include assertions that women are frequently at risk of death due to Ireland's abortion laws, that the government's proposed changes are necessary to address extreme cases, and that numbers of abortions by Irish women will go down with the planned changes. The latter claims in particular have often contradicted other published statements by abortion advocates. These claims about future abortion numbers will be addressed here based on empirical observations from other countries that have made comparable changes to their abortion laws. slower decline for ages 20-34 since 2008, with continued rapid decline for ages 15-19 and leveling of rates for ages 35 and above. For women ages 15-34, abortion rates are currently lower than any point since at least 1980. Figure 1. Ireland abortion rates by mother's age. Figure 2 shows abortion percentages, which is the percentage of known pregnancies aborted (not counting spontaneous fetal deaths or miscarriages). Abortion percentages rose for all age groups consistently from 1970 to 1990. The rate of rise actually increased for women aged 25-29 in the late 1990s but leveled thereafter; this could be associated with changes in the fraction of women in the workforce. Abortion percentages dropped sharply in 2004-2008 for all age groups but have been relatively consistent since 2008. Figure 2. Ireland abortion percentages by mother's age. In AWR WP#18, limited speculation was offered regarding possible future trends in abortions with a change in Irish law. Here, we provide results of demographic models in an attempt to quantify estimates of future abortions in the wake of the 25 May vote. This modeling is again primarily empirical, based on analogies to other European countries regarding their abortion trends following legalization. Note that these results are possibilities and not predictive; nonetheless, they are far superior to the vague, unfounded, and mutually contradictory assertions of those that advocated changes in Ireland's abortion policy. abortion rates by Irish residents in the UK in 2007-2016 are fit to an exponential fit and this is used to extrapolate abortion rates by age group to 2060. This captures the decline since 2000 of rates for mother's ages 15-35 and the relatively constant rates in recent decades for older women. abortion numbers are derived from the above then increased by 10% to address underreporting. Results are shown in Figure 3. The rate of decline is slower after 2020 in part because as the female population ages, more of them are in age ranges showing less decline in abortion rates. Figure 3. Reported abortions and modeled future abortions with no law change, Ireland. The United Kingdom, which is culturally similar to Ireland despite having a less similar law. Austria is not included despite having a similar law because reported figures fail to include most abortions (Johnston, 2018). Average, low, and high estimates are based on the above country trends from the year of legalization. After the first 4 years, trends are smoothed with a 4-year running average. 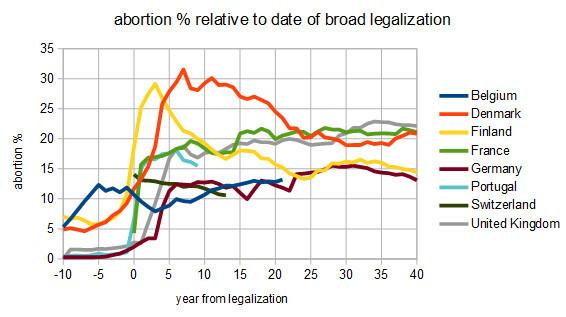 Figure 4 shows the abortion percentage trends for the eight countries used. Though some countries quickly reach a peak in abortions then decline, a majority of the listed countries maintain higher abortion levels which is evidenced in the average trend. Some countries with short time series (e.g., Portugal) do not contribute for the entire time period. Figure 4. Trends in abortion percentages for the 8 country sample, relative to year of broad legalization of abortion. 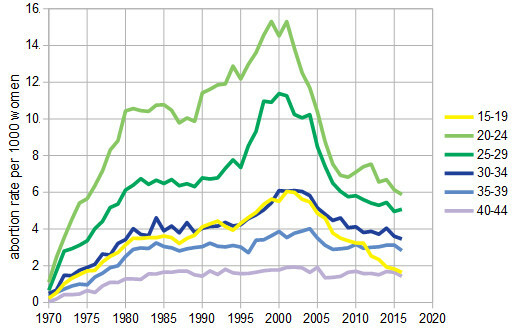 Figure 5 shows resulting trends applied to Ireland. For the models with legalization of abortion occurring, the median estimate is for a rise to double current abortions by 2020, to 10,000 abortions per year by 2025, and a long term level of 12,000 per year. Levels in the late 2020s could be from 6,000 to 17,000 per year, though both high and low end estimates are tending to converge by 2050 (this is partly a reflection of actual country trends and partly an artifact of having few country trend series to rely on for 30 years). 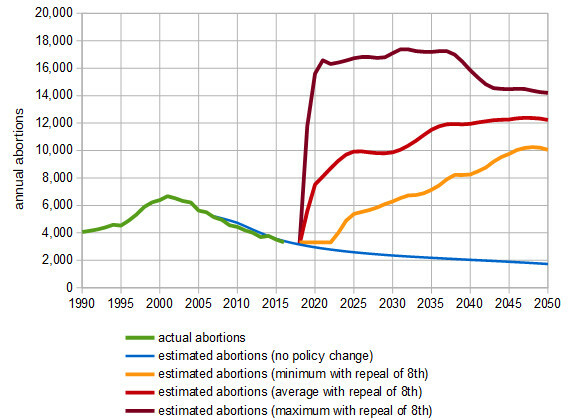 With the above model results for abortions with and without a law change, estimates of changes in live births are possible. This assumes that the overall number of pregnancies is unchanged. In reality, data from European countries shows that abortion increases after legalization are often greater than the drop in live births, which implies in these cases that many of the abortions represent pregnancies that would not have occurred in the absence of a law change. 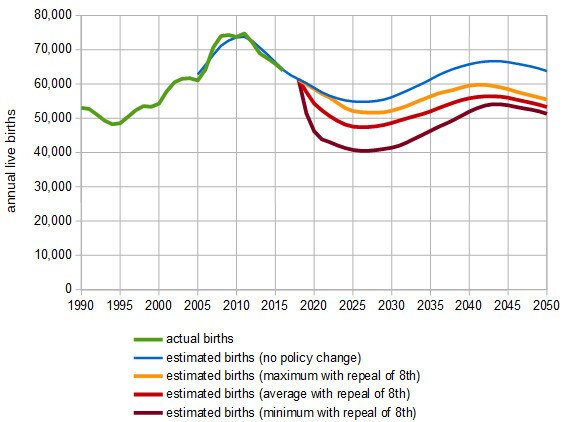 Nonetheless, with the prior assumption the future live births for the Republic of Ireland are estimated in Figure 6. The additional abortions over 35 years are 6.4% (3.7--10.0%) of the current Irish Republic population. The history of Ireland's population changes is a unique case. 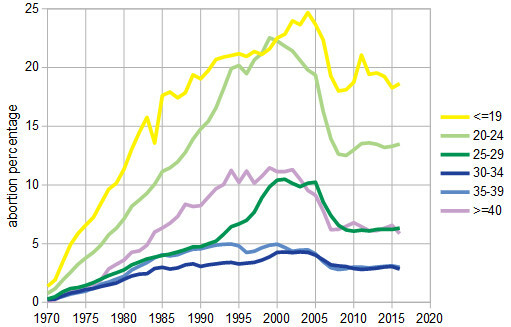 Figure 7 shows Irish population from 1500 to the present. Ireland experienced very rapid population growth from the late 1700s to about 1840. The Irish Potato Famine, with complete failure of the main staple crop in Ireland combined with mismanagement of alternate food sources, led to as much as one million deaths from starvation and disease. This was followed by mass migration from Ireland to other countries. Ireland as a whole is still less populous than it was in the 1820s-1840s. Figure 8 shows Irish annual births from 1750 to the present, based on reported data from about 1860 and estimates for earlier times (including estimates by the author). 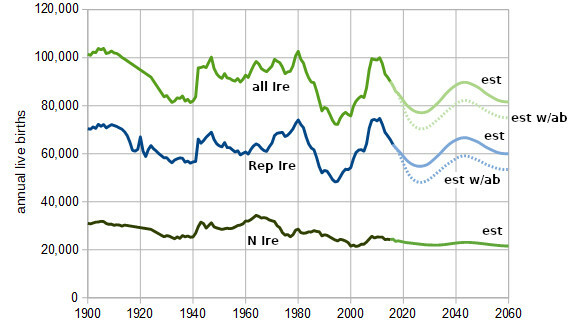 Figure 9 shows Irish annual births from 1900 to the present from reported data, plus estimates from now until 2060 (based on UN projections for the Republic of Ireland and on Government of Northern Ireland projections for Northern Ireland). In addition, possible impacts on future live births are shown based on the model results described above. 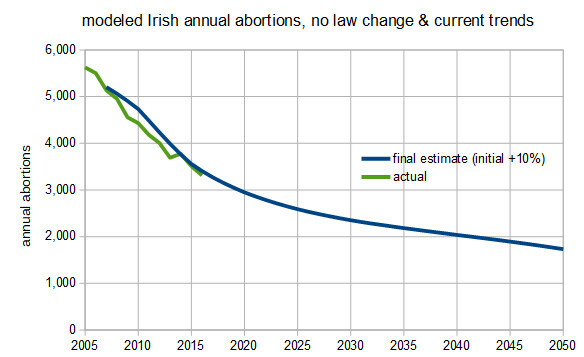 Abortion legalization could cause Irish live births to reach a historic low in the 2020s and/or 2050s--which if it happens would be the lowest for Ireland in over two centuries. Irish abortion rates have been trending downward for the last 15 years, with current known abortions at 3,300 per year. This trend will be reversed with legalization. Median estimate is for abortions to rise rapidly to 10,000 per yer in the late 2020s and eventually peak at 12,000 per year in the late 2040s. Upper and lower estimates range from 6,000 to 17,000 per year in the late 2020s and from 10,000 to 14,000 per year in the late 2040s. In the next 35 years, an additional 300,000 total abortions are estimated over the baseline case for no policy change, with a range of 180,000 to 475,000. These figures amount to 6.4% (range 3.7% to 10%) of the current Irish Republic population. If median to higher estimates come to pass, Ireland in the coming decades will likely see the lowest numbers of live births in the last 250 years (surpassing the last low point occurring in 1994). Department of Health (Northern Ireland), 2016-2018, "Northern Ireland Termination of Pregnancy Statistics," Department of Health, on line [https://www.health-ni.gov.uk/news/northern-ireland-termination-pregnancy-statistics-2016-17]. Department of Health (Republic of Ireland), 2014-2017, "Notifications in accordance with Section 20 of the Protection of Life During Pregnancy Act 2013--annual report," Department of Health, on line [http://health.gov.ie/blog/publications/notifications-in-accordance-with-section-20-of-the-protection-of-life-during-pregnancy-act-2013-annual-report-2016/]. Jacobson, Thomas W., and Wm. Robert Johnston, eds., 2018a, Abortion Worldwide Report, GLC Publ. (West Chester, OH). Jacobson, Thomas W., and Wm. Robert Johnston, eds., 2018b, "The past, present and potential futures of abortion in Ireland: Insights from international abortion data," AWR Working Paper 18, on line at GLC or Johnston's Archive [http://www.johnstonsarchive.net/policy/abortion/ireland_abortion_2018.html]. Johnston, Wm. Robert, 25 March 2018a, "Historical abortion statistics, Ireland," Johnston's Archive, on line [http://www.johnstonsarchive.net/policy/abortion/ab-ireland.html]. Johnston, Wm. Robert, 27 Mary 2018b, "Notes on levels of abortion in Austria," Johnston's Archive, on line [http://www.johnstonsarchive.net/policy/abortion/austria_abortion_notes.html]. Copyright © 2018 by Wm. Robert Johnston. Last modified 12 August 2018.